BHOPAL: With nine days left to garner 67,446 signatures to get a response from the White House, NGOs working for the welfare of Bhopal gas survivors have sought support of other organizations working for human causes. Bhopal gas tragedy that occurred in 1984 is among one of the world’s biggest and worst industrial disasters that killed more than 10,000 people. The affect of poisonous MIC (methyl isocyanides) gas could be seen on the third generation as well. Indian government had charged the Union Carbide Corporation (UCC) with man slaughter along other charges but UCC refused to show for the trial. In 2001 Dow Chemical bought the UCC and made compensation matters more complicated. India has sent four notices to the US Department of Justice to summon Dow Chemical to explain UCC’s whereabouts. India and US are signatory to Mutual Legal Assistance treaty, under which the notices has been sent to the US, department of justice. It was moved by the International Campaign for Justice in Bhopal, North America from May 15 at the White House official website. Rachna Dhingra of Bhopal Group for Information and Action, says that the petition needs 1 lakh signatures before June 15 to make US government respond. The petition required 67,446 signatures within 9 days to reach 1 lakh mark. Representatives of gas survivor organizations are confident to reach that mark before due date. Sofia Ashraf, the rapper is out with a new video seeking justice for the survivors of Bhopal Gas Tragedy . 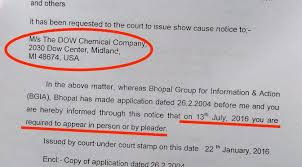 The organisations hope that the pressure created by the ongoing petition will force the US Department of Justice to serve the notice on Dow Chemical which in turn will have to explain to the Bhopal court why it continues to shelter Union Carbide, a fugitive from justice.